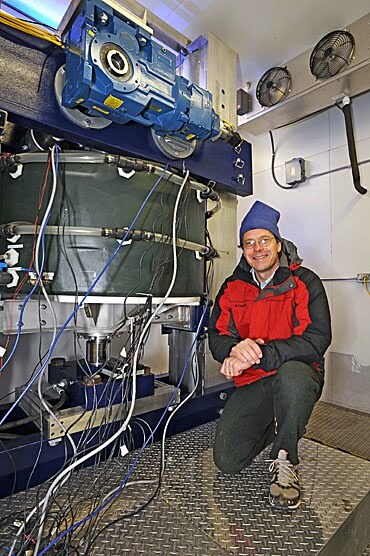 Neal Iverson opened his laboratory's walk-in freezer and said the one-of-a-kind machine inside could help scientists understand how glaciers slide across their beds. And that could help researchers predict how glaciers will react to climate change and contribute to rising sea levels. Iverson is an Iowa State University professor of geological and atmospheric sciences. He's worked for three years on his big new machine, which is over nine feet tall, that he calls a glacier sliding simulator. At the center of the machine is a ring of ice about eight inches thick and about three feet across. Below the ice is a hydraulic press that can put as much as 170 tons of force on the ice, creating pressures equal to those beneath a glacier 1,300 feet thick. Above are motors that can rotate the ice ring at its centerline at speeds of 100 to 7,000 feet per year. Either the speed of the ice or the stress dragging it forward can be controlled. Around the ice is circulating fluid - its temperature controlled to 1/100th of a degree Celsius - that keeps the ice at its melting point so it slides on a thin film of water. As Iverson starts running experiments with the simulator this month, he'll be looking for data that help explain glacier movement. "For a particular stress, which depends on a glacier's size and shape, we'd like to know how fast a glacier will slide," Iverson said. Glacier sliding is something that matters far from the ice fields. As the climate warms, Iverson said glaciers slide faster. When they hit coasts, they dump ice into the ocean. And when those icebergs melt they contribute to rising sea levels. But there's a lot about the process researchers still don't know. "We can't predict how fast glaciers slide - even to a factor of 10," Iverson said. "We don't know enough about how they slide to do that." And so Iverson came up with the idea of a glacier in a freezer that allows him to isolate effects of stress, temperature and melt-water on speeds of glacier sliding. The project is supported by a $529,922 grant from the National Science Foundation. While Iverson had a rough design for the simulator, he said a team of three engineers from the U.S. Department of Energy's Ames Laboratory - Terry Herrman, Dan Jones and Jerry Musselman - improved the design and turned it into a working machine. Iverson said the machine won't simulate everything about glacier sliding. "The fact is we can't simulate the real process," he said. "We can only simulate key elements of the process. The purpose of these experiments will be to idealize how the system works and thereby learn fundamentals of the sliding process that can't be learned in the field because of the complexity there." Iverson, who also does field studies at glaciers in Sweden and Norway, said glaciology needs work on the ground and in the lab. But it's been decades since anybody has attempted the kind of laboratory simulations he'll be doing. "There hasn't been a device to do this," Iverson said. "And so there haven't been any experiments." To change that, Iverson is pulling on a coat, hat and gloves and working in his lab's freezer. He has ice rings to build. Equipment to calibrate. And experiments to run.